The Geos is a great deal more than just a wind meter. It also reads the temperature, the pressure, the altitude, the relative humidity and the dew point. For good measure they throw in a clock with timer, a high precision needle compass and a wind vane. No other hand held instrument in the world can give you the same highly accurate meteorological information. The ball impeller will measure mph, kph, knots and m/s. Current, average and max options on the display. There is also a separate scale on the display which always indicates the beaufort scale. Located below the impeller the wind vane will indicate when the instrument is centred correctly. 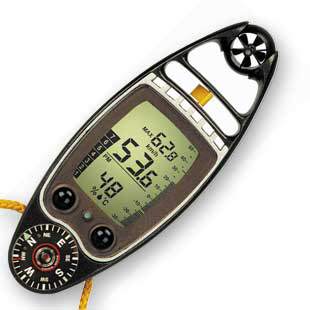 When used in conjunction with the compass it will tell you the wind direction. A high precision Swiss needle compass is built into the instrument. South, North, East and West are just some of the options available. The wind chill factor can be displayed on the LCD. The instrument will indicate at what temperature condensation (cloud) will appear. It is displayed in °C or °F. The clock is displayed in standby mode in either 24 or 12 hour with am and pm indication displayed. The Geos is powered by 3V type CR2032 and comes with a free replacement battery. With more information than any other handheld instrument, the Swiss-Made Weather-Pro is a high precision, professional weather station suitable for the most demanding scientific and field requirements. - A new range of multi functions in this handheld meteorological station. - Atmospheric pressure with historygramm for the last 12 hours. - All electronic parts are protected in a metal case, for professional heavy-duty. - Temperature displayed on a bargraph, with minimum, maximum and wind chill factor. - Current, average, maximum windspeed up to 125 MPH. - TEMPERATURE: Updates every 1 min. in tenths. - BAROMETER: Samples every hour. - MEASURES: 4.75" x 1.8" x .9"